Melt margarine in small skillet over medium heat. 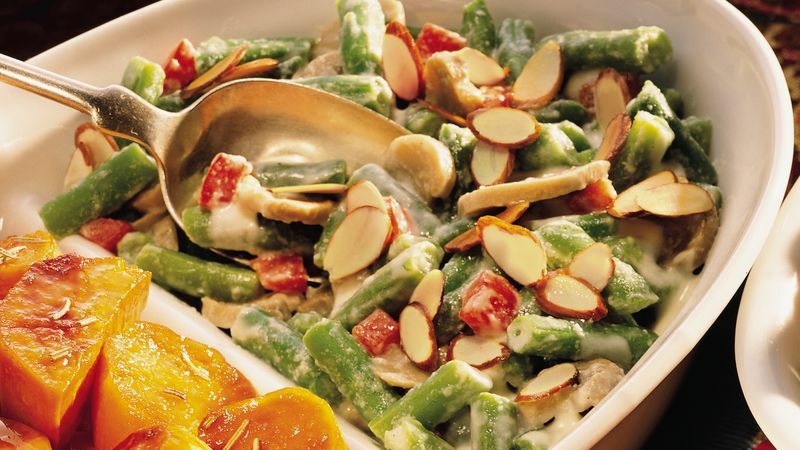 Add almonds; cook 3 to 4 minutes or until golden brown, stirring occasionally. Remove from skillet; set aside. Meanwhile, in 1 1/2-quart microwave-safe casserole, combine green beans, bell pepper and water. Cover; microwave on HIGH for 11 to 14 minutes or until vegetables are crisp-tender, stirring once halfway through cooking. Drain. Uncover; stir in mushrooms and Alfredo sauce. Sprinkle with toasted almonds. Microwave, uncovered, on HIGH for 2 to 3 minutes or until bubbly around edges.